The New Seven Little Fortunes helped to celebrate Chinese culture and China’s 60th birthday. Jackie taught the crowd of a thousand the lyrics and meaning of ‘Nation’. Full House will be shot in Taiwan and China and discusses the cross-strait ties that modern Chinese are concern about. 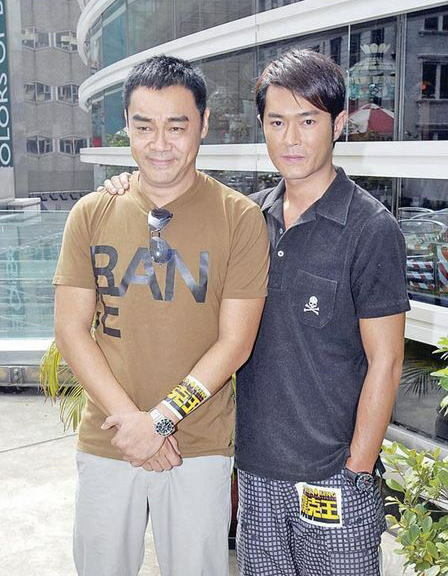 Francis Ng went shopping in Central. After 15 minutes, he was done. However, he couldn’t find his car for over an hour! Thanks for more gratuitous Francis Ng information–he doesn’t look as pretty as he does in the fashion pictures from Monday, of course. In fact, his personal wardrobe seems to be pretty weird. I’m glad to hear that he found his car, though. Sleep deprivation from having a baby in the house? Re: Karen Mok. Glad to read that she’s got the class to recognize how Stephen Chow helped launch her career. She’s a cool chick.